The Raspberry Pi is a great piece of hardware. However you don't always want to hook it up to some screen and keyboard when working with it. I in fact never did since I like to do everything using SSH which is enable out of the box if you are using the raspbian distribution. So just hook it up to your router and start hacking. But what if you have no router and only you Mac? The Raspberry Pi is configured by default to receive an IP address from a DHCP server. So you need a DHCP server. 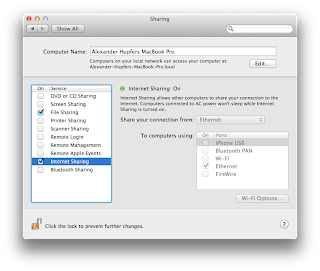 This can be done using the sharing option in OSX. Just set it up like that, ignore the warning about your ISP, since you are not connecting to anything but you Raspberry Pi. You can also share your wifi-connection if you are at home but if you have secure enterprise wifi this option doesn't work. Once you have enabled this option just connect your mac and Raspberry Pi using an ethernet cable and THEN connect the power to the Pi.